Welcome to Advent! That’s what we call the weeks before Christmas. Advent – a time of expectant waiting, a time of hope, because God has set his eyes of love upon us and upon this world, to save, to rescue, and to heal us and this world from brokenness and sin. This morning, as Advent begins, hope turns to courage, in the story of three men imprisoned in a fiery furnace: courage to oppose earthly authorities, and courage to stand strong in their faith in God, even in the face of death. The story of Shadrach, Meshach, and Abednego takes place around 600 B.C., when the people of Israel had been taken into exile, forcibly removed from their homes by the powerful Babylonian army, and resettled in a land far away, somewhere in the area of modern day Iraq. The governing power in that land, King Nebuchadnezzar, had a statue constructed for people to worship, and then he enacted a law ordering them to do so under the penalty of death. The story of Shadrach, Meshach, and Abednego is still needed today. Religious persecution has, unfortunately, not gone out of style. We may live in the “land of the free,” but the freedom of religion that we enjoy in the United States does not exist in all areas of this globe. In many countries, who dare to share a faith not approved by the ruling authorities, can lose their families, their businesses, their homes, and, yes, even their lives. But here, in our Bible reading is a message of hope and courage. 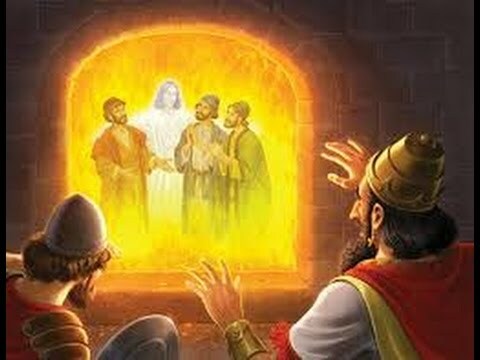 Much has been written about the fourth person who appears in that fiery furnace with those three men. Was it an angel? Some have seen this fourth person as a pre-figuring of the Son of God. I like that. It tells me that, as followers of Jesus, we can stand firm in our faith, that God who delivered Shadrach, Meshach, and Abednego is present with us in our suffering and even in our death. Paired with the story of Jesus’ trial before Pilate, and own suffering and death, these stories stand as encouragement to us, to remain faithful to the Lord, even when our faith is opposed, challenged, or tested. When I think of stories of courageous faith, my thoughts go back to our history of racial inequality in this country, and the fight for civil rights. In the summer of 1963, just months before President Kennedy was assassinated, there was turmoil in this country, over racial equality and desegregation. That turmoil boiled over during a peaceful demonstration of adults and school children led by the Rev. Dr. Martin Luther King, Jr. in Birmingham, Alabama. Authorities decided to disperse the demonstrators with fire hoses and attack dogs. That incident captured the nation’s attention, demonstrating the lengths to which some would go to protect the status quo, and marking the beginning of the end of racial segregation in the South. Politics and religion joined hands to maintain slavery and segregation in this country. Both slavery and segregation were legitimized by the White church as being biblical. The argument went like this: Abraham had slaves, in the Old Testament, and Paul, in the New Testament told slaves to obey their masters. Noah’s son, Ham, was cursed by his father for dishonoring him, and his supposedly dark skin, it was said, was a sign that all dark-skinned people were cursed as well. Hopefully, the church has learned something from this about interpreting God’s word in the Bible. When the Church forgets the centrality of God’s Son, Jesus, who came to “let the oppressed go free” and who welcomed all people as equally loved by God – when we forget that, then we are in danger of letting the politics of power and exclusion rule over our interpretation of God’s word. The point that the writer of Daniel and the Gospel of John make, is that we need not fear to speak up or act when laws of our land, or even the teachings of a church, threaten to trample the weak or oppressed.We need not fear opposing the cultural or even political rules that run counter to Jesus’ own rule of love, for we live ultimately under that rule. So where is it that you see idols seeping into our culture – idols that are lifted up as demanding our obedience? Some have said that consumerism – the need to buy and accumulate – is an idol in our culture. What do you think? Don’t you get tired of Christmas ads, telling us that we need more stuff? What kind of effect does this culture of greed have on our children? I would like to think about a Christmas where the focus is on giving, especially to the poor and destitute and needy, instead of accumulating for ourselves; a Christmas where the focus is more on what we can do to serve others and not on what we will get for ourselves. What do you think? Isn’t that what Christmas is about? Remembering who we are and whose we are, remembering that we belong to our Lord Jesus and not just to ourselves – this is what will strengthen our faith and give us courage to live our lives for the Lord and not just for ourselves. I mentioned in the children’s message how each of us was born for God’s purposes. God gave us life with his purposes in mind. God saw that we had lost sight of his purposes for us – that we had lose sight of his place in our lives. The Bible calls this sin and brokenness. But God set his eyes of love upon us, and sent his Son Jesus to take on our human flesh, to enter into our human experience and to save us, to rescue us, and to heal us from our brokenness and sin. God sent his Son to bring us back to God, to forgive our sin, to show us God’s love for us, and to teach us God’s purposes for us. This is our hope. This is the Grace of God given to us in Jesus that we celebrate in our worship every Sunday. And now, God calls us to respond to that Grace, that hope, by living lives of courageous faith – speaking out against injustice, standing up for our faith when it is opposed, challenged, or tested, and sharing the love and truth of God with others. This is the way forward for our church. This is the way forward for our lives. This is the purpose God has for us. And we will not be alone, for God will be with us. Shadrach, Meshach, and Abednego endured the flames of persecution, and yet remained faithful and lived fully for the Lord. This story is meant to encourage us, so that when we encounter things in this world that challenge our faith we too can remain faithful and live fully for the Lord.